On your mark, get set, go! is a reading comprehension game where the students compete against each other to be the fastest team to correctly answer a series of questions based on a short piece of text. This is a fast paced activity that can be used as an individual or small group game. I only had three students in my class when I tested this idea so the students competed as individuals which worked really well. Choose a small piece of text, no longer than one side of A4. Write a series of questions based on the text. Laminate and cut each question out individually. 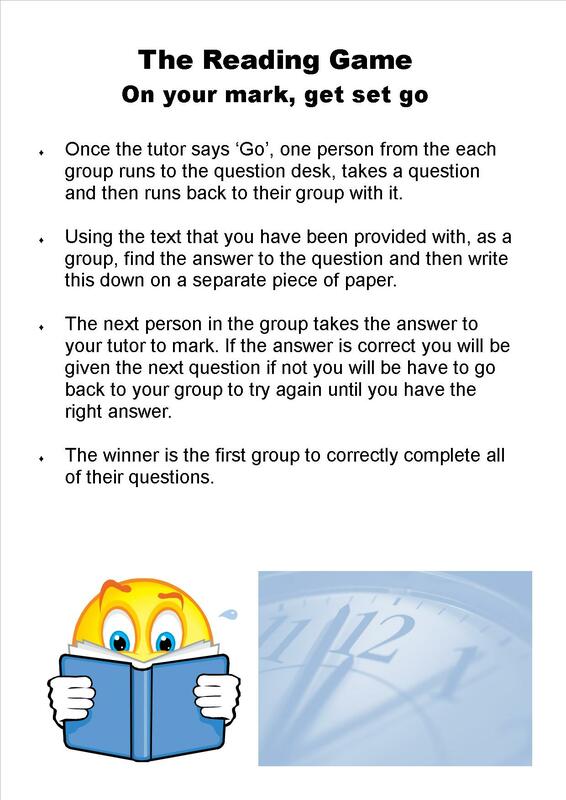 Give each group a copy of the text and the first question. Facilitate the game from your desk. Once the tutor says ‘Go’, one person from the each group runs to the question desk, takes a question and then runs back to their group with it. Using the text that you have been provided with, as a group, find the answer to the question and then write this down on a separate piece of paper. The next person in the group takes the answer to the tutor to mark. If the answer is correct you will be given the next question if not you will be have to go back to your group to try again until you have the right answer. The winner is the first group to correctly complete all of the questions. This entry was posted in Resources and tagged Literacy by Gemma H. Bookmark the permalink.